Closed from work for the day, I walked down to the parking lot to get to my car and begin my journey homeward to my beautiful family awaiting my return. I start the car, check my phones are connected to the hands free, switch on my music (Reunited by Gaither Vocal Band) and off I went. There was a little traffic and people who weren’t patient enough as usual had taken to the oncoming lane so as to sharply enter in the front. I saw them and kept of moving but the driver of the car behind me in a bid not to allow them enter her front hit me from behind and was not even sorry for doing that. I sat unhappy and angry and asked her through my side mirrors why she would hit me and she didn’t care. Now the person she didn’t want to enter her front, saw enough space and entered mine and went on his way. I continued my journey and before I knew it, the driver who hit me was in my front and suddenly applied her brakes. I had the opportunity to hit her and become even. My head told me to but my heart said no and I obeyed my heart and swerved to the next lane and continued homeward. It looked like all these kind of drivers maybe had a meeting and decided to be on my way home. Shortly after the initial scenario, another impatient driver had the nose of his car right in the way and faced me who had the right of way to stop and was still accusing me of trying to hit him. Thinking that was all, another who knew his house was on the right but decided to drive on the free left lane suddenly swerved to my front and turned right at his gate with the bottom of his car right in the way. I was forced to apply my brakes, wait for him to enter his gate or the other lane to be clear for me to move there. Unfortunately, he didn’t enter in time and there was a lot of traffic on the other lane, so I waited. After the first incident, how I remained calm through the rest, I can’t explain. But one thing I learnt from everything was PATIENCE… It only takes seconds for avoidable accidents to happen. As I continued my journey, all the people who had passed me, I began to overtake them as we drove down the queue towards to the cashiers at the toll gate. God placed me on the fastest lane without struggle and I arrived home in good time. This applies to our journey in life. I wrote in my last post that overtaking is allowed in life and we should not create unnecessary competitions for ourselves with other people. 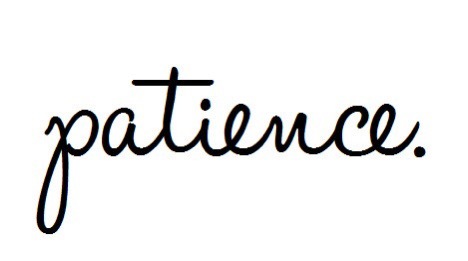 We must learn to be patient. Growing up, we were told that “The patient dog eats the fattest bone” but these days what we hear is “The patient dog gets no bone at all” because the former has become a clichè and it’s true meaning, people have decided not to believe. PATIENCE is a VIRTUE which should be coveted. Pray to God to help you grow to be patient, play your part consciously. Patience indeed brings good things one’s way. It brings Favour, it brings blessings from God and even men. You might say, but I’ve been patient for a very very long time and I ended up losing. My dear friend, were you really patient or lazy about it? Many a times Laziness have been mistaken for patience. While being patient, you play your part, you work, you don’t just sleep or sit on your behind. You work on yourself, you work on your attitude, you work on your character and so many things that needs working on. If the water from the springs don’t make efforts to move out, would they be drinkable? I admonish you to learn to be patient with your spouse, your children, your siblings, your parents, your friends and even your acquaintances. Practice patience, live patiently with people. Impatience lands you in unnecessary and avoidable troubles.